My current release is the third book of a trilogy set among the Nez Perce of NE Oregon. These books came about after an editor said she’d like to see more historical paranormal. Having written historical westerns I felt the only paranormal element that made sense to me was incorporating Native American spirits into a book. And out of that thought came Spirit of the Mountain , Spirit of the Lake and Spirit of the Sky. The spirit entity in these books is all a figment of my imagination, but it felt real to me. My fascination with the Native American culture, their healing herbs, chants, legends, myths, and vision quest all primed my imagination when I came up with the spirit siblings who are the main characters in the books. In the first book, Spirit of the Mountain, I use the vision quest as the means to bring the chief's daughter to talk with a white wolf, Himiin(Wolf), the hero and spirit of the mountain. In her vision quest, her weyakin(the spirit who visits her) is a white wolf. So when her life is thrown upside down by her believing her vision quest means she must marry a warrior from the enemy Blackfeet tribe, she feels talking to the wounded white wolf she encounters is natural. When he turns into a handsome warrior, doing her duty becomes harder as she must leave the mountain and spirit of her heart. The second book, Spirit of the Lake, has Wewukiye (Bull Elk) as the hero. He is the white wolf's younger brother and a spirit as well. He lives in the lake as the antlered legend who comes out of the lake and takes bad children. Yet he is the fun loving practical joker of the three sibling spirits. In his book, he befriends a Nimiipuu maiden who has been raped by a Whiteman and becomes pregnant, but the band pretends to not believe her to avoid trouble and perhaps being tossed from their land because the treaty which took away their land was not signed by Old Joseph, yet the government believes the other chiefs who signed spoke for all the Nez Perce. 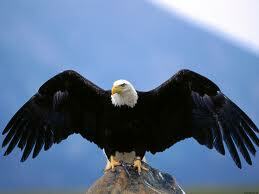 Sa-qan (Bald Eagle) is the youngest of the three. In Spirit of the Sky, she soars in the sky above all the Nimiipuu land watching over them. In the third book, she is desperately trying to keep the Nimiipuu from annihilation as the U.S. Army chases them from their homes on a four month, 1400 mile trek where they fall short of freedom and end up on reservations far from home. During the campaign she falls in love with a cavalry officer and together they try to save the Nimiipuu. When the US Army forces the Nimiipuu from their land, Sa-qan, the eagle spirit entrusted with watching over her tribe, steps in to save her mortal niece. Challenging the restrictions of the spirit world, Sa-qan assumes human form and finds an unexpected ally in a handsome cavalry officer. Certain she is a captive, Lt. Wade Watts, a Civil War veteran, tries to help the blonde woman he finds sheltering a Nez Perce child. While her intelligent eyes reveal she understands his language, she refuses his help. But when Wade is wounded, it is the beautiful Sa-qan who tends him. Wade wishes to stop the killing—Sa-qan will do anything to save her people. Can their differences save her tribe? Or will their love spell the end of the Nimiipuu? She smiled and his heart leapt into his throat. He thought her beautiful from the first moment he saw her standing in the river fiercely protecting the child, but watching her tense face relax and smile, he was smitten. A light and pleasing calm washed over him for the first time in a very long time. He could only bask in the moment briefly. They were enemies. Her touch warmed his body, tingling the areas around his wounds. He glanced at her small, delicate hands hovering over his injuries. He shut his eyes, and then opened them. Her hands shimmered as if in a fog. His pain subsided, in fact, his body felt well rested. A soft lyrical chant rose from her lips as she continued to hover her hands over his wounds. Her eyes remained closed, her light lashes resting on her sun-kissed cheeks. He’d never seen a woman as beautiful as this. He had to learn her true origins and return her to her family. Wife, mother, grandmother, and the one who cleans pens and delivers the hay; award winning author Paty Jager and her husband currently ranch 350 acres when not dashing around visiting their children and grandchildren. She not only writes the western lifestyle, she lives it. She is a member of RWA, EPIC , and COWG. She’s had eleven books and a short story published so far and is venturing into the new world of self-publishing ebooks. Her contemporary Western, Perfectly Good Nanny won the 2008 Eppie for Best Contemporary Romance and Spirit of the Mountain, a historical paranormal set among the Nez Perce, garnered 1st place in the paranormal category of the Lories Best Published Book Contest. Spirit of the Lake was a finalist in the Gayle Wilson Award of Excellence. You can learn more about her at her blog; www.patyjager.blogspot.com her website; http://www.patyjager.net or on Facebook; https://www.facebook.com/#!/paty.jager and twitter; @patyjag. Contest! I’m giving away a $5 Amazon gift certificate to one lucky commenter. Blog Tour Contest! Each blog stop has a picture of an eagle in the post. Follow the tour and send me the number of different pictures you saw while following the tour. To learn where I”ll be go to my blog(http://www.patyjager.blogpsot.com) or website(http://www.patyjager.net) If there is more than one correct entry I’ll draw a winner on May 21st to receive a $25 gift certificate to either Barnes and Nobles or Amazon, a handmade custom ereader cover, and chocolate. Send your entry number to: patyjag@gmail.com by May 21st. 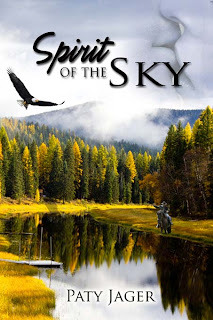 I found myself doing a bit of research on the Nez Perce when I first started reading Spirit of the Sky. I like your dedication to the research involved in these books. congrats again, Paty. I love the Nez Perce and admire them. Good luck with the release! Just bought this book, Paty, after reading an excerpt on another site. I love historical mixed with paranormal elements. Best of luck with this new release! Thanks Mk. I'm glad it piqued your interest to check them out. The whole push behind these books is to educate people about a tribe that has been long overlooked. Hi Susan! 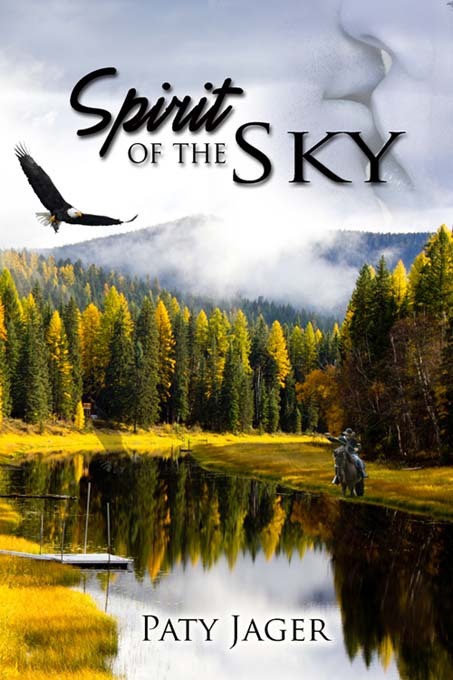 Thank you for purchasing Spirit of the Sky. Let me know what you think. Very nice excerpt and post. Looking forward to the series. Lauri, is my comments winner on this blog!